On the morning of July 21, 1861, the Union Army under the command of Brig. Gen. Irvin McDowell, in an effort to cripple the newly assembled Confederate Army at Manassas, Virginia, fired the opening shots of the first major battle of the Civil War. Both armies were largely made up of volunteer militia with regiments on both sides wearing blue and gray uniforms. 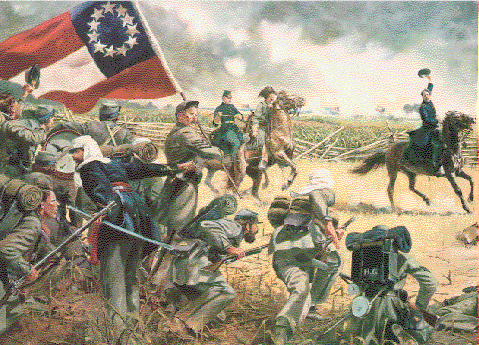 The brunt of the Union attack fell on the Confederate left flank. Confederate Brig. Gen. Bernard Bee, having recently resigned from the U.S. Army and still wearing his blue uniform, realized that the army's left flank was seriously exposed. Bee ordered the Fourth Alabama to advance rapidly in order to plug the gap in the Confederate line. For over an hour, the Fourth Alabama held its position and repulsed several Union regiments. The gallant stand of the Fourth Alabama stalled the Union advance and gave the Confederate forces more time to regroup The regiment played a prominent part in the fighting all day and contributed to the Confederate victory. The Battle of First Manassas proved to both sides that the Civil War would be a bitterly contested struggle. The Fourth Alabama went on to fight in every major battle in the Eastern Theater of the Civil War and never surrendered its colors. The heritage and traditions of the Fourth Alabama are carried on by the 1st Battalion, 167th Infantry, Alabama Army National Guard.